Gallo en Fuego creates "Gear with a Past" by up-cycling decommissioned fire hoses to make belts, wallets and T-shirts. 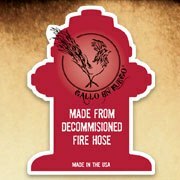 "Gallo en Fuego salutes our heroes, America's Firefighters. We're honored to partner with National Fallen Firefighters Association in their mission to remember America's fallen fire heros and assist their survivors in rebuilding their lives. From every sale we donate a portion of our proceeds to help families of those who have made the ultimate sacrifice." Made in the USA! What a rich existence these raw materials have seen in their lifetime! Many of the hoses come from New York City, and have actually been retired fire hoses. To retire, they have seen a lot of life in them! The fire hose is then utilized to make some amazing products. Check out this handmade, one of a kind fire hose wallet! "Keep bills, credit cards, and important papers safe in a wallet made from real fire hose, Each wallet is handmade from genuine decommissioned fire hose and often bears distress marks from being in service. Handmade. Each is one-of-a-kind and will vary slightly. 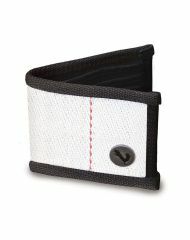 The wallet's heavy-duty design contains the original rubber lining of the fire hose for extra strength and durability." What a Super Dad gift this year!! Great for your graduating seniors as well! My review coming soon with additional photos! Enter to win a wallet for your Super Dad from Gallo en Fuego! I learned that every man you see on their site is an active-duty firefighter; some are also paramedics. Wow, I love that they donate to the Fallen Firefighters Found! I love that a portion of all sales go to the National Fallen Firefighters Association teo days ago there was a fire in an apartment building in Houston and 5firefighters died these guys put their lives on the line everyday. I learned that they have great belts too. I think it's great that they support the Fallen Firefighters Association. They have great firehose belts. I learned Gallo En Fuego (guy-o en fway-go) means "Rooster on Fire" in Spanish. Each of the products is designed by 2 Red Hens Studio designer Lori Holliday. I learned that a portion of the proceeds is donated to the National Fallen Firefighters Association. I learned that most of the fire hoses come from New York City. I love that from every sale they donate a portion of our proceeds to help families of those who have made the ultimate sacrifice! How awesome! They sell belts too. I like the Gallo En Fuego Fire Hose Belt for Adults - The Original. I learned that offer a kid's belts....what a great way to make them understand the importance of firefighters! I learned that they partner with National Fallen Firefighters Association in their mission to remember America's fallen fire heros and assist their survivors in rebuilding their lives. I learned that designer Lori created the product to honor her husband and fellow fire fighters. I also learned a portion of the profits go to the Fallen Firefighters Foundation. How amazing!! I learned that they make belts and t-shirts and that they donate a portion of their proceeds to help families of those who have made the ultimate sacrifice. I learned that they donate a portion of our proceeds to the national fallen firefighter association. I learned that they are partner with National Fallen Firefighters Association.